Our February event is a public lecture on William Morris. William Morris was an artist, textile designer, craftsman, poet, novelist, and pioneering socialist. His fiction helped establish fantasy as a genre, his artistic endeavours were an enormous contribution to the British “Arts and Crafts Movement”, and his political thought varied from grand revolutionary flair through to a deep concern with the day to day aspects of what a decent life for all would mean. 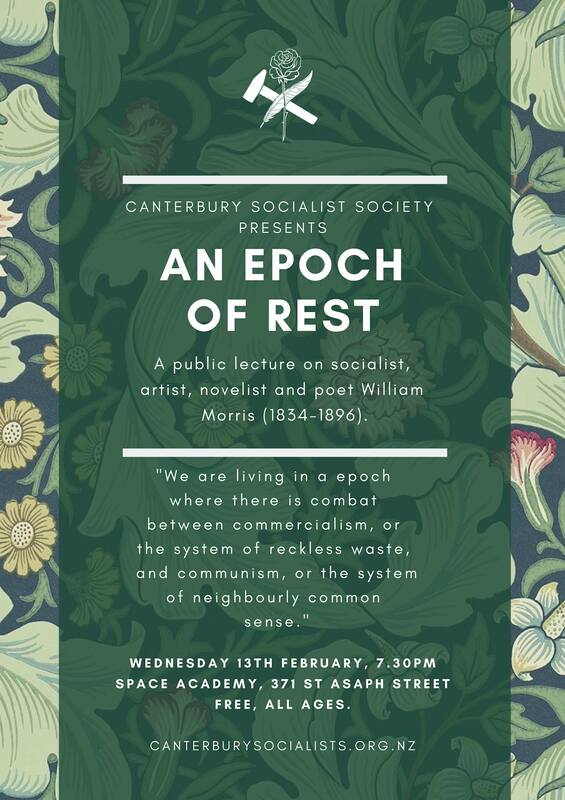 Canterbury Socialist Society are delighted to have Martin Crick speaking to us on this topic. Martin is the author of “The History of the Social-Democratic Federation” (1996), as well as many articles on British socialist history. Before emigrating to New Zealand Martin was a trustee and vice-chair for The William Morris Society. Martin’s lecture will provide a brief sketch of Morris’ career as an artist, writer and business man, his revolt against the capitalist system and how he crossed his ‘river of fire’ to become a socialist. This will be followed by an account of his socialist theory and its ever increasing relevance today, particularly his ecological writings and theories of work. We are immensely grateful to Space Academy for hosting our events in 2019 and their ongoing support.